When learning how to cook a ham, there are many factors involved. There is a wide and varied choice of smoked pork products available to you. Hams come in boneless, semi boneless or boned in. You can buy them unsliced or spiral sliced or you might want just a center cut ham steak. There are so many different techniques when learning how to cook a ham. If you remember a few things about hams, it will make it easier to select a cooking process. First most hams are more salty than other meats because of the curing process. Country hams such as the Smithfield and Virginia hams are the most salty. When learning how to cook ham of this salty type, the first thing to remember is that they are more time consuming but worth the effort. They have to be soaked in fresh water, then rinsed and cooked in fresh water prior to baking. This process will remove a lot of the salt. When learning how to cook ham like quick cured or tender hams such as the boneless rolled type. These will need no soaking or precooking. They also require a shorter roasting time than the home cured or old style cured hams. Basting hams with special sauces or glazes make delicious baked hams. Ingredients like brown sugar, honey, juices, pineapple, bourbon, Coca Cola and others will help cut the salty taste. And also blend your favorite flavors into the ham. The glazes baked on the ham help to make a pretty presentation for a holiday dinner. The length of time and the temperature that a ham is cooked at is mainly determined by weight; review the ham cooking instructions. Make sauce day ahead and chill overnight; blend mustard, vinegar, rum, eggs, sugar, butter and pepper mixing well. Score top of ham; stud with cloves at crosses of scoring; place ham in roasting pan. Blend Dijon mustard, garlic and plum sauce with orange juice to form a syrup consistency; spread evenly over top and sides of ham. Sprinkle brown sugar over ham; bake for 1 ½ hours. Add sugar to hot coffee and let cool. Brown ham slices over medium heat about 5 to 7 minutes on each side in large skillet (Preferably cast iron). Remove ham from skillet and keep warm; reserve drippings in skillet. Add coffee mixture to skillet stirring to loosen particles from bottom of skillet; bring to a boil. Boil and stir mixture until mixture reduced in half; serve immediately with ham. 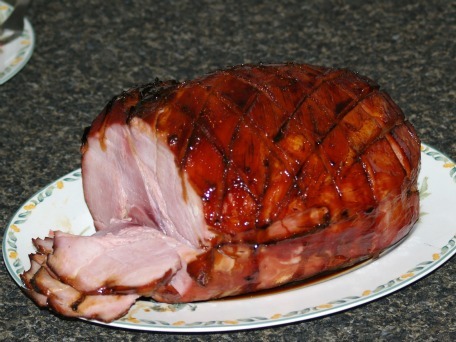 Learning how to cook a ham with a bourbon glaze recipe makes a very special ham for holidays. To make bourbon glaze recipe combine honey and molasses in a small saucepan over medium heat. When mixture is warm whisk in the orange juice, bourbon and mustard. Remove skin and excess fat from ham and place in a roasting pan. Score top and coat with glaze. Bake on low oven rack for 2 hours or until meat thermometer registers 140F degrees in thickest part. Baste ham occasionally during cooking with bourbon glaze recipe. 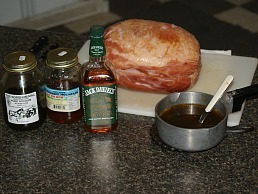 After cooking combine remaining bourbon glaze with ham drippings; bring to a boil and serve with sliced ham. When I was young and learning how to cook a ham, my in-laws had a fit because I was going to serve ham without apples. Supposedly, they believed because of some health reason, you could not eat ham without some form of apples. I don’t remember the exact reasoning behind this but they refused to eat ham without the apples but that is they way they learned how to cook a ham. Wrap ham in aluminum foil and place in a shallow baking pan; bake for 2 hours at 325F degrees. 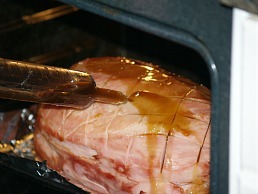 Remove ham from oven and increase oven temperature to 450F degrees. 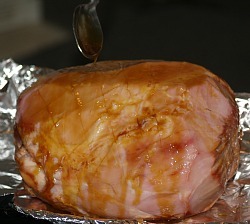 Remove foil from ham; remove skin and excess fat from ham. Score ham in diamond shapes ¼ inch deep in ham; insert whole cloves at cross sections. Brush ham with ½ Cup of apple juice. Combine and mix ¼ cup apple juice, sugar and mustard; pat mixture evenly over the ham. Arrange orange slices over the ham and secure with wooden tooth picks. Bake for 15 to 20 minutes or until meat thermometer reaches 140F degrees and the sugar has melted into a glaze. To prepare apples melt butter in large skillet; add sliced apples. Cover and steam a few minutes over medium low. Add cinnamon and sugar and stir to blend until sugar melts. Arrange apples around ham on platter.